Summer is on it’s way and it’s time to bring out the bronzer, shimmer and highlighters to restore the natural glow to our dull, pasty faces! I don’t know about you but the severe lack of sunshine has been bringing me (and my complexion) down recently. 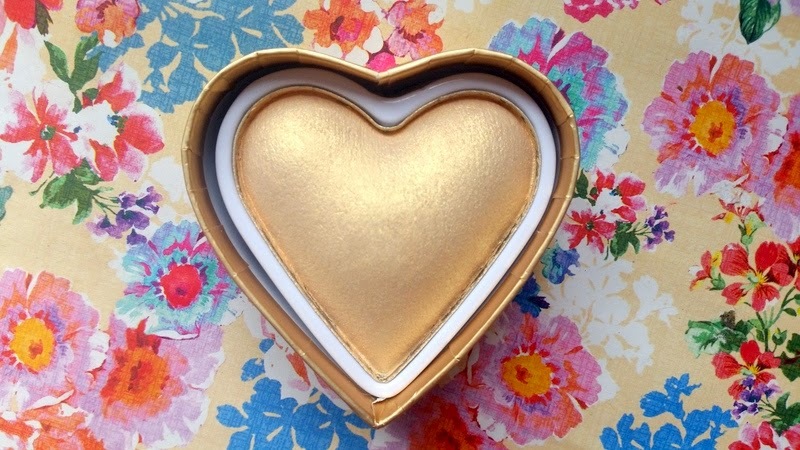 I was so excited to receive the triple baked heart collection from I ♥ Makeup and Makeup Revolution. The beautifully packaged trio included; the Summer of Love bronzer, Goddess of Love highlighter and Blushing Hearts blusher. All three products retail for £4.99, with the Blushing Hearts blusher being hailed as a dupe for the Too Faced Perfect Flush Blush which retails for £21! 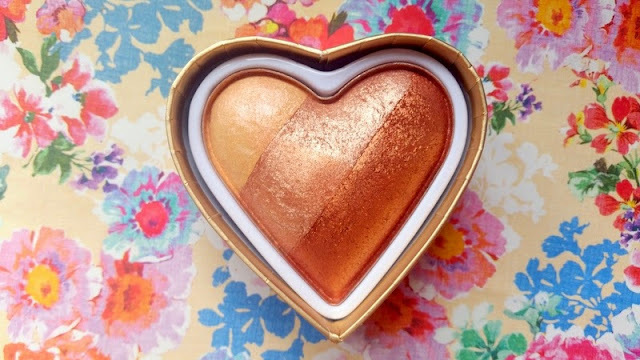 The Goddess of Love highlighter in Golden Goddess is a pretty intense gold shade in the packaging which I appreciate some may find a little intimidating. However, this highlighter is actually a lot softer than I first anticipated. It gives a subtle glow to the skin without being to cakey or glittery. I simply apply the silky powder with my fingers or Real Techniques Setting Brush to my cheekbones and brow bone to add definition and give a natural glow to my skin. The powder is easy to work with and so versatile, as it’s buildable depending on what look you’re going for. 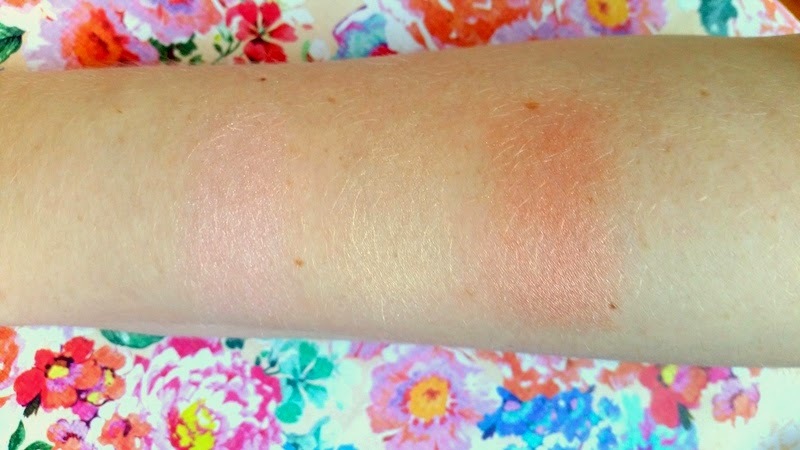 I expected the blusher to instantly be my favourite of the three but I’m really impressed with the pigmentation and over all look this highlighter gives! 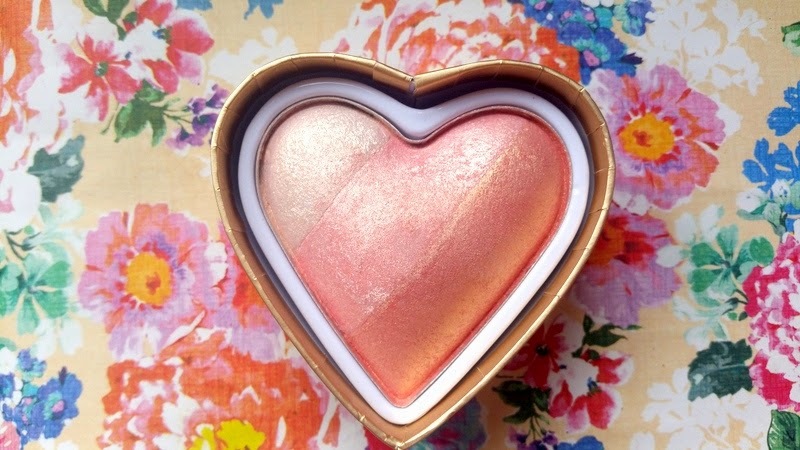 The Blushing Hearts Triple Baked Blusher in Iced Hearts contains three beautiful shades that combine to give a pop of pretty pink colour with shimmering golden iridescent particles. I find this shade a little too on the gold side, as on my cheeks it acts like a highlighter more than a blusher. The pink is very cool and gets a bit lost leaving the gold to shimmer through when the light catches it. This shade would be lovely if I were on a beach somewhere and looking for a product that gives an overall sun-kissed look but I’m afraid I found this to shimmery for everyday wear. The Summer of Love Triple Baked Bronzer in Hot Summer of Love is for me, the highlight of this lovely trio. The soft textured powder picks up well on my Real Techniques Powder Brush and blends evenly giving a soft, but noticeable, glow to my pale skin. I like to combine all three shades to give a more natural finish however you can, of course, pick out your favourite colours to work with. Just like the other two Blushing Hearts, Summer of Love is packed with pigment and, on top of my Prime Time by bareMinerals primer, lasted all day without fading! The swatches below give you a good idea of the pigmentation and shades but I feel my camera doesn’t fully capture the way all three baked hearts look when the light hits them. Each of the three powders is extremely buildable and versatile depending on your look but the swatches are a good indicator of the shades you are working with. From Left to Right: Blushing Hearts in Iced Hearts, Goddess of Love in Golden Goddess and Summer of Love in Hot Summer of Love. All three of the Blushing Heart retail for £4.99 . "Beauty | Glossybox – Summer’s Calling"